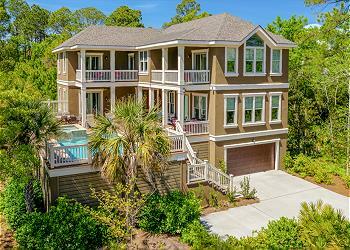 Pet-friendly* 4 bedroom, 3 bath home, with private pool located in the Bradley Beach area of Hilton Head. Just a 3-minute walk to the Driessen Beach Park! The main level hosts the kitchen, laundry room, dining area, living room, and master bedroom. To the right of the entrance is the breakfast area that offers seats for 6. The kitchen counter bar provides 2 additional seats. The kitchen with updated stainless steel appliances overlooks the breakfast area. Down the hall is the living room has plenty of seating and a large flat panel TV. Adjacent to the living room is the dining area that can seat up to 6 people. To the left of the main entrance is the king master suite. The garden tub, walk-in shower, and double vanities are private off the bedroom, while a half bath shares access by the hallway. There are three additional bedrooms located on the 2nd floor. The twin bedrooms at the top of the stairs share a Jack and Jill bath. The one twin bedroom has 2 twin beds and a set of twin bunk beds. The other twin bedroom has 2 twin beds. The Queen bedroom on this level has a private bath. Enjoy a vacation with your whole family; even your beloved pet*. •	Pool cannot be heated. •	*Pet Friendly to Dogs under 30 pounds with a non-refundable pet fee.